It’s hard to believe now, but winter will be here soon. 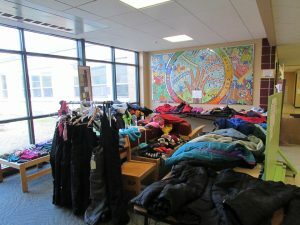 As you go through your winter clothes from last year, if you find any good winter jackets, coats, snow pants, boots, etc. 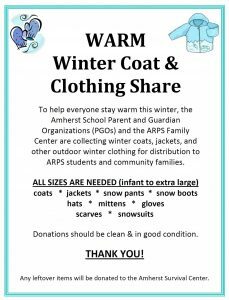 that your kids have outgrown or that you no longer need, the PGO asks that you consider donating them to the ARPS Winter Coat & Clothing Share. Donations should be clean and in good condition. Donation boxes will be placed in the Crocker Farm lobby and at the parent pickup area the last week of October. We are also doing a special collection effort on Election Day, November 6. Distribution of the collected items will take place in the Crocker Farm main lobby the last week of November. All school and community families are welcome to stop by then and look for what they need.